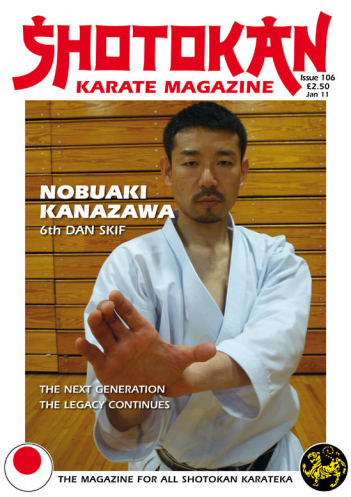 NOBUAKI KANAZAWA 6th Dan SKIF.Interview By Seamus O'Dowd. TEACH AND LEARN KARATE: By Jonathan De'Claire. IBRAHIM EL MARHOMY 7th Dan ITKF. Interview By Eric Arame. SHOTOKAN FOR THE MATURE STUDENT. By Malcolm Phipps. LIFE LESSON. By Brian Gonsalves. KARATE: FROM 'JUTSU' TO 'DO', AND BACK AGAIN. By Mike Clarke. If you are born the son of a famous father and you follow in their footsteps by choosing the exact same career path, the weight on the son's shoulders can be enormous! Many times in the past this has happened and rarely with success. With the Beatles for example: John Lennon's son, Julian Lennon had a very short lived musical career. Ringo Starr's son Zak is a far better drummer than Ringo ever was but nobody has heard of him, why? And now in our art, karate-do, a massive task lies ahead for Nobuaki Kanazawa, the son destined to take over from probably the most famous and popular Traditional Karate Master of the past 50 years, Kancho Hirokazu Kanazawa. In this interview we learn what makes this young man tick, and how he feels about the daunting task that lies ahead of him. We in Shotokan Karate-do wish him well. At the end of this year 2010, Kanazawa Kancho will limit his travel around the world teaching thousands of students in every country and continent you can name. He has been doing this for the past 50 years and single handedly built one of the largest organisations in the world, SKIF (Shotokan Karate International Federation). He will now concentrate on teaching at the SKIF Hombu dojo in Tokyo and leave the arduous travelling, flying all over the world, to others. This job will now be handed over to his son Nobuaki sensei and other senior SKIF instructors. Master Kanazawa is highly respected by students and instructors from ALL martial arts styles and not just Karate-do, however, it's quite remarkable that one man has had such a massive influence spreading the Budo message to so many people in one particular martial art, namely Shotokan Karate-do. In a way it is very sad that we may not have the opportunity to train again with this great man but for those of us who have enjoyed this unique experience many times, the memory will be with us forever. Good luck in the future to Master Kanazawa from all of us in the Shotokan World regardless of affiliation. 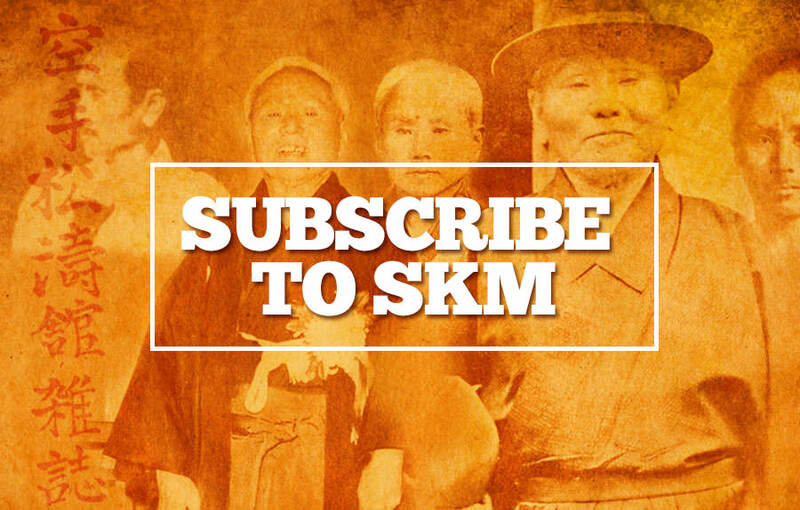 Many readers have stated that they often like to have two interviews in each issue of SKM in order to see the contrasting views, technical ideas, philosophy and opinions of different Shotokan instructors. So, also in this edition we have an interview with sensei El Marhomy 7th Dan ITKF, a long time student of the late Hidetaka Nishiyama sensei. Having been there and trained myself, I can tell you that sensei El Marhomy has a beautiful dojo in the heart of Paris and the teaching and technical standard is world-class! If ever you visit this amazing city I advise you to take your do-gi and seek out this dojo. They are very welcoming, friendly with excellent, constructive karate sessions. Also, with the added bonus that the dojo is situated right next to Paris' Chinatown, so what better way to finish the night after training than a nice cold beer and authentic Chinese food. Enjoy!! Ibrahim El Marhomy sensei, is the representative in France of Traditional karate. We will be talking about the legacy left by Nishiyama sensei and what is the situation of Traditional karate today. Here we are at the dojo Rue des Rigoles in the 20th district of Paris. It is here that each year Nishiyama Sensei came for his seminars. With the dojo's sensei Ibrahim El Marhomy, we are going to talk about his memory and the way he influenced Traditional karate worldwide. Ibrahim El Marhomy (right) with his sensei, the late Hidetaka Nishiyama. Q: It's almost been two years that Nishiyama Sensei passed away, how has his teaching been passed down? A: Sensei Nishiyama opened a path, the path of tradition for his students. He didn't choose an heir for his succession. He was a universal man, he taught everywhere in the world, on every continent. The most important thing to emphasise, is that he didn't only teach like every other sensei, he left writings behind him. I remember what he told me one day, he told me that... "only the writings never die". It helps the preservation of the path, today, the Canadian, Richard Jorgensen, one of his student's is at the head of the International Traditional Karate Federation, and everything is going alright. Q: He didn't choose an heir? A: No, and that choice really surprised a part of his close American students. But I will say it again, everything about the traditional karate has been saved in writings. Nishiyama sensei always said, "Now that Nakayama is gone, it is my duty to maintain the traditional karate for the next generations. Because he wasn't precise enough about what we were supposed to do, there was some excesses, notably in sport; we lacked of writings about that matter." He was very aware of that matter and he did significant work to keep the karate in all its integrity. Q: What writings did he leave? A: There are the rules of ITKF for all competitions and grades; the technical rules, and what we call the ITKF instructor's training. Each and every technique is detailed and very well defined. Nothing is left to chance. In the matter of competition, for two years now everything is going great the world cup took place, and the Europe tournament took place in Poland, then the world championship in Brazil. The teaching at the dojo will always be something unique, because we don't only give information, we also give a bit of ourselves to the students. Q: We can say that ITKF survived Nishiyama sensei's death? A: Exactly, Nishiyama sensei was like a father to me, through his teaching. I asked him more than once, "Sensei, what do you wish for, what is your dream?" "My dream is that the traditional karate keeps living." He spent his whole life until the end in a karate-gi to teach, he didn't have any personal ambition. Even after being decorated by the emperor of Japan, he was still a simple man who looked like an average person. His main goal was really to preserve the traditional karate. Q : Did Nishiyama sensei's teaching change your way of practicing karate? A: Yes it changed everything. One day I asked him: "Should a karateka train like a samurai?" He answered: "The time of the samurai is over." He wanted that the traditional karate become an educational art, not only physical but also mental, not only for adults but also for children, and teenagers. Through traditional karate we can lead to a true education, today for our children and grandchildren. Thanks to his teaching, I have changed a lot my ways of teaching but also my way to study and my way to communicate with my students. Q: How did it change? A: I was formed by the first generation of JKA instructors, back then karate was really rough! Today my students are businessman; artists; hand workers or ordinary people, they finish their day of work and come to train after. They have two lives in one day. When they come here, I do not teach them only physical karate. I teach a karate that can help them improve their own lives. I give them something to think about so they can apply what they did at the dojo in their everyday lives, either in a mental or physical or professional or even in their relations with their families. Their visions completely change. This is well defined in the 4 commands for the instructors, it is said that you should study the physical and mental abilities of your students in order to teach them well. It's not a question of teaching because you are able to do a thing, it's a matter of transmission. I used to teach what I was able to do, Nishiyama sensei taught me the transmission. How? You have to go deep in order to try to touch people, so they can become receptive. Nowadays we're in a world of media where everything is going very fast. When you want something, you just have go to the internet. But you can't find everything on the internet. The teaching at the dojo will always be something unique, because we don't only give information, we also give a bit of ourselves to the students. We try to adapt things for the person in front of us. Q: What are the 4 commands of the traditional karate instructor? A: 1) Guide your students in the right path. 2) Earn the respect and the trust of your students by showing the best behaviour, the best nature possible. 3) Keep your progress and personal training, in order to improve your technique, always stays ahead of your students and show them the path. 4) Carefully analyse the physical; psychological and mental condition of your students, in order to guide them in a better suited direction for their development. Q: You told me that Nishiyama sensei transformed karate. What do you mean by that? A: We are in a world were there's a fashion phenomenon, when something is "in", everybody wants to do the same thing. I was a bit upset because some pretend to do traditional karate, without knowing what it is. But sensei told me: "You should not worry about it, people who talk without knowing, will always remain ignorant". In one word, traditional karate, is the original form of karate who work on the physical and mental in order to lead to an unity through practice. Obviously, everybody can say that, but everything is defined by technical as much as pedagogical aspects, through practice and through the teaching: it's really a very profound thing, something very precise. Nowadays, there are teachers who are so pedagogically poor that teach a year or two, that it's very difficult to bear, after a while, because they are so away from the path and technically poor, they choose what we call tips, they practice karate with hoops. They have the feeling that they bring something new but they only really have lost themselves a bit more from the path. The real things are simple things. But how to adapt our teaching for a child, a teenager or an adult? Because they all need something different. When a child wants to do karate, he has his own image of it, his imagination, the teacher is not allowed to disappoint him, he has to pass down the thing in the way the child wants to see it, but surrounded with a true educative purpose so the child will have a real value. Through our teachings we have very good results, on the educative and scholar level, a lot of children who used to have troubles at school have done a lot better. The late Nishiyama sensei (left) training in Paris with sensei El Marhomy. Q: Some karate teachers who have been teaching for years sometimes feel weariness because of the repetitions, and sometimes quit teaching? A: I met Nishiyama sensei during training courses in the 70's. Like you know, I'm from Egypt, I arrived in France in 1980 and then I spent my time practicing karate with all the experts I could meet. There was a time in my life when I thought I understood everything, I was impressed by nobody anymore. Then fate put me on Nishiyama sensei's path. I remember the first of his seminars that I attended, for a week from 6 am to 5 pm, we had 7 hours of classes a day, plus the theoretical part. I told him: "Sensei, your teaching is really complex, it is very difficult to apply, you ask for the impossible." He laughed and told me: "You must not think about all that, you must just start". And so I did, I worked for 15 years with Nishiyama sensei, I followed him everywhere, and every time he used to say: "Hurry up because we don't have time". He always taught with passion. At the end of every seminar he was always worried: "Was it good, did people understand, did the message reach them, did they learn something?" The path is not defined, it's not determined, when we say that karate is the same, everybody finds his path. When someone teaches, there comes a time when one can get a lack of interest, because he became poor, he stopped training, he stopped recharging. During an interview on television Nishiyama sensei was asked: "Sensei what do you do to still have that much energy, and how do you recharge yourself?" He answered: "I give to my student and they also to give me, I recharge myself by their side". But in order to recharge yourself with your students, you have to make a bond with them first. When you don't have a bond with the people you teach, then you are alone. When you teach 10 people, 20 or 100 people, we show what we can do, after a while, your battery is running low. But if you communicate with your students, you are recharged by them, we give to them and they also give us back. I teach to traditional karate's instructors: "Don't think you are the only one giving, you are also receiving". But in order to teach you have to be on the path, you have to communicate; you have to feel; you have to know which way to go to deliver your teaching. A lot of teachers show, but they don't teach, teaching is to pass down the knowledge. When you're watching TV you learn the news, you can repeat it, but you didn't feel it. Teaching is not something you can show, it is passing down something you felt. A: One day I asked sensei Nishiyama: "How do you see the future of traditional karate?" He answered: "What about you, what do you think? Do you believe in traditional karate? Do you believe in what you're doing?" I told him, "Sensei, I found my path, this is what I will do until the end of my life." He answered: "Then traditional karate will keep going. I am only a link in a chain, the chain must go on. It is the path of the traditional karate. You must not worry, as long as you stay on the path, there is no need to worry".